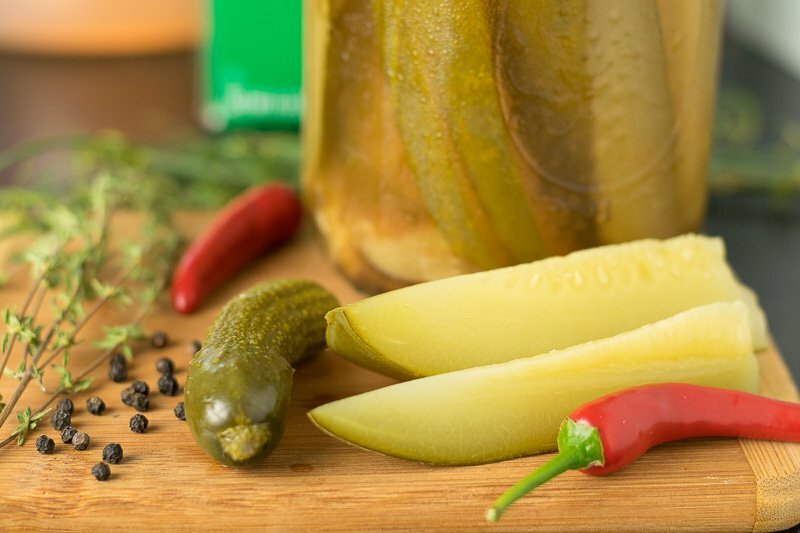 I can’t help but think of my old German ancestors any time I can pickles. To me canning and pickling is a lost art kept alive by those of us with a deep love and respect for food, wishing to preserve the tradition behind and the connection to the food we eat. However, I’m sure my great grandma never canned my spicy cider dill pickles in her kitchen. These hot peppers would have been as foreign to her as the idea of buying pickles as the store. I came up with this recipe when my friend was helping me install my new dishwasher. We had to run to the hardware store and a jar of cider pickles on the counter seduced me into making a delicious impulse buy. I don’t remember if they were spicy or not, but I do remember they will intoxicatingly delicious! I kept the empty jar on top of my fridge for months, vowing to replicate the secrets contained within its ingredients list with my garden’s harvest a few months later. After a few batches, and countless adjustments, I’ve ended up with a product I am quite happy with. The peppercorn, thyme, and cider combine to give it almost a distinct smoky flavor that is cut through only by the pleasant bite of a chili pepper. I recommend Thai peppers, but any similar pepper will suffice. 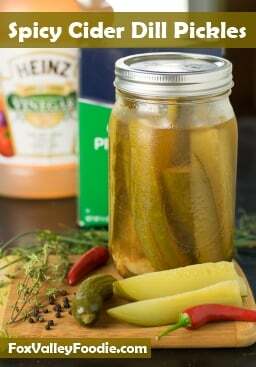 This recipe is well suited for canning, but for those who don’t can you can certainly just throw the jars into the fridge for storage. However, if you are wanting to get into canning I would recommend purchasing a good canning kit from the Ball company. They are the leading brand in canning supplies. 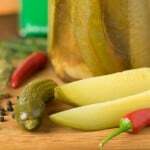 Spicy Cider Dill Pickles are a deliciously briny twist on the classic pickle. Boil water, cider vinegar and salt in a saucepan until salt has dissolved. Place dill, thyme, peppercorns, garlic and chili pepper in sterilized quart jars. Pack cucumber spears vertically in jar tightly together. 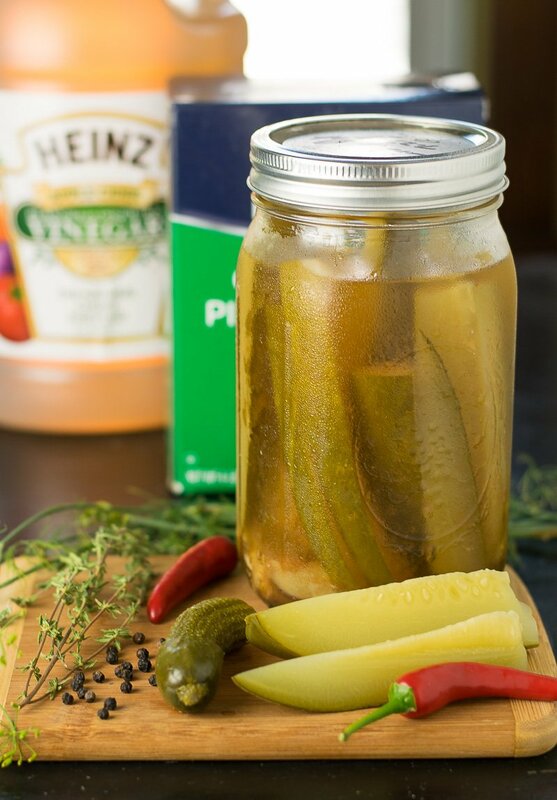 Pour hot brine over the pickles to within 1" of the rim and store in the refrigerator or, if canning, process in a waterbath for 10 minutes and follow all normal canning procedures. Yield will vary depending on how tightly jars are packed. If you enjoyed reading my spicy cider dill pickles recipe then you should probably like me on Facebook and follow me on Pinterest too. That’s what I would do at least, because if you don’t get to know me but you still use my recipe it is kind of like taking candy from a stranger, and your mom taught you not to do that. Don’t disobey your mom, subscribe to Fox Valley Foodie today. I am not sure what you are asking. The recipe yields about 4 pint jars for me, which is listed in the recipe. and further states; .Place dill, peppercorns, garlic and chili pepper in sterilized quart jars. My apologies, I was looking at the wrong recipe when I made that comment. Please disregard my comment, since I now see you answered a similar question below. However, why not just fix the recipe or is this not possible in the programs you use? Thank you for the exceedingly quick response to my first comment. So I assumes the recipe given here is right as written and should be interpreted to mean makes about 6 quarts. I regret posting earlier without reading all the posts, but just went until a new thread started (went back to the left border instead of indenting further). My bad. PS: Today is a day to be careful outside. What an icy threat. Thanks, you are right, it should have been updated initially, however sometimes I don’t have the time when I review the comments and I forget to circle back to it later. I have now corrected the recipe (it should include thyme). If you see any other errors or contradictions, please let me know. Thank you for your recipe however I’m confused. It doesn’t mention jar size except in your reply to a comment where you say 4 pints however the recipe itself just says “6 jars”. You also mention thyme in the description and show it in the picture but it is not listed with the ingredients. Some clarification would help-thanks! Sounds amazing! Sorry for the confusion. Unfortunately that part of the recipe got jumbled up when I switched to a different recipe program for my website. Luckily it doesn’t really matter. Whenever I am canning I plan on using extra jars so I have plenty sterilized and ready to go, then simply put away the ones you don’t end up using. The total yield always varies anyhow depending on how they are packed.